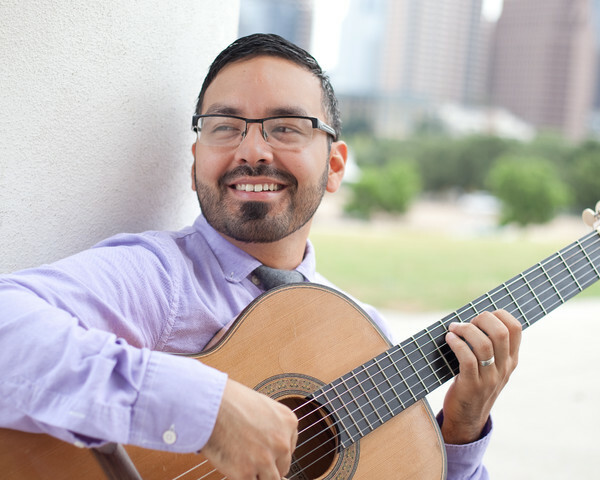 Arnold Yzaguirre (website) leads this no-pressure foray into playing the classical guitar. No experience required! Our Beginning Guitar Class is intended for adult students looking for a fun and informative introduction to playing this beautiful instrument. This class is now full. If you’d like to be put on the wait list, please email Karen here. Thank you! This 10-week class meets from 8 – 9 p.m. on Wednesday nights, February 6th through April 17th, 2019 at Austin Classical Guitar (5900 Balcones Dr., Ste 240, Austin 78731). Participants will need to bring their own nylon-string classical guitar and a footstool. We have a limited number of guitars available to borrow – if you’re interested, please mention it in the “Notes” field on the checkout form. For those who would like to purchase their own instruments, we recommend any local music store or Fiddler’s Green on 35th Street (Cordoba brand guitars are reasonably priced and reliable).